The inclusion of ‘road’ in their name implies that the study of these arts takes you on a life-long journey. As you study these arts, you not only learn about the art itself but also about life in general. It takes many years to master these arts, and even the master is never finished with his studies. These arts exemplify Japanese culture at its purest and are often closely linked with Zen Buddhism. 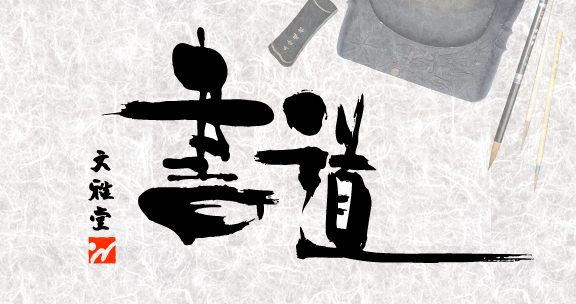 There is however another word to indicate Japanese calligraphy: shūji 習字. It refers more to good penmanship and writing neatly than to sophisticated art and walking ‘the great road’. 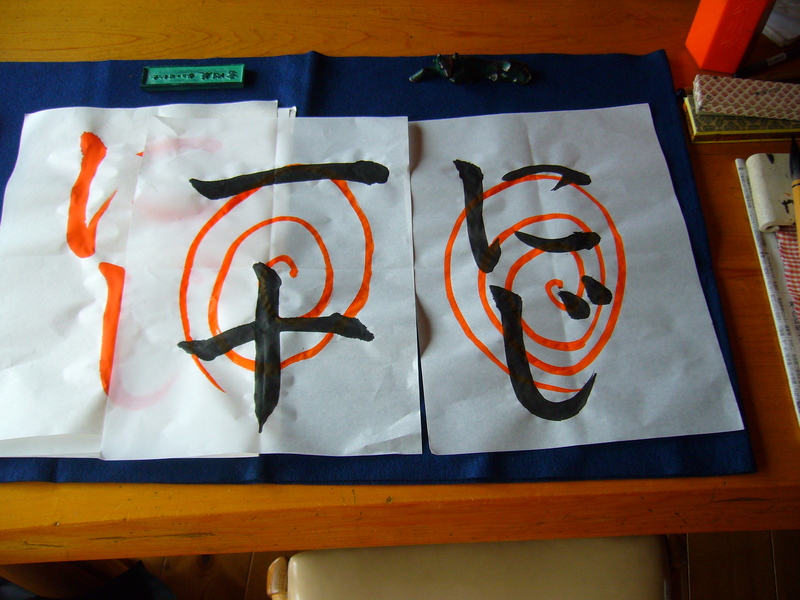 It is for example used to indicate the calligraphy lessons that are a mandatory subject in elementary school. 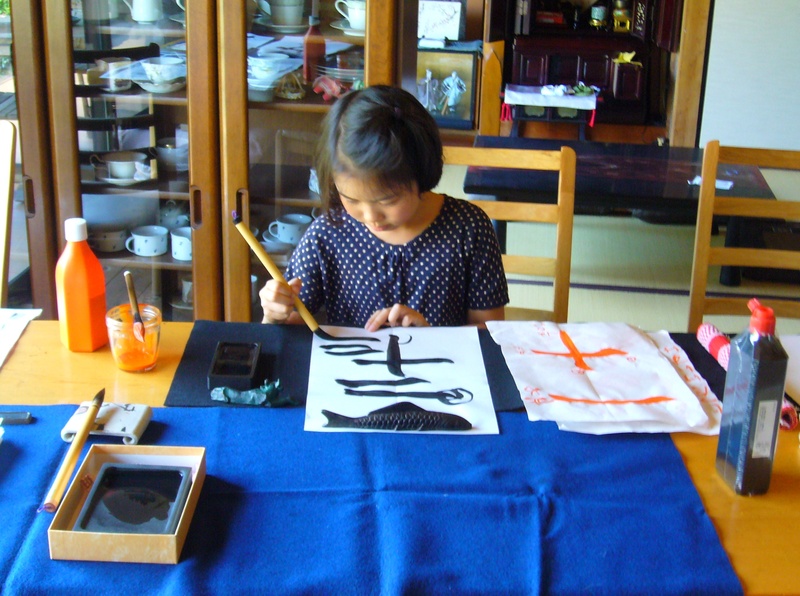 In high school, Japanese calligraphy is no longer a mandatory subject but one of the choices among art subjects like painting and music. It is also a popular high school club activity. 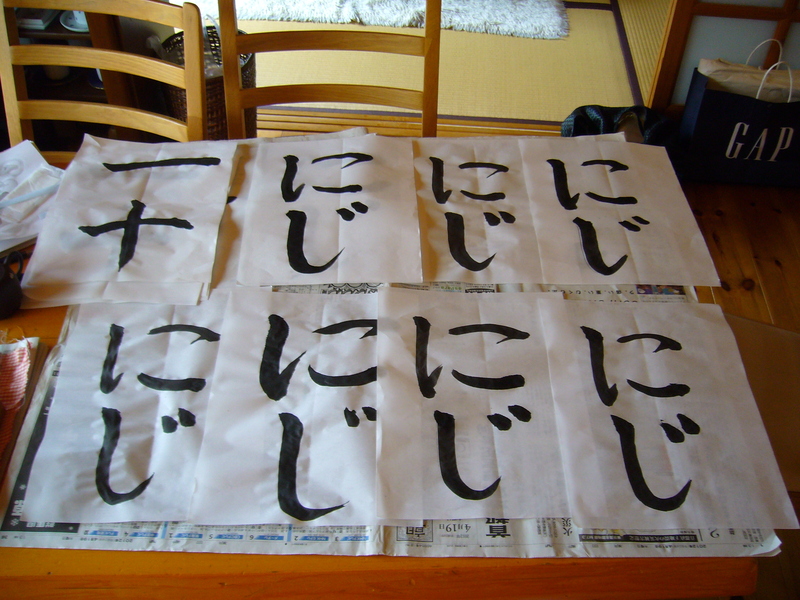 People who are really serious about calligraphy continue (or start again) to study as adults. Over the years, they earn different degrees until ultimately, after ten years or more, are qualified to teach themselves. Here is a closer look at the utensils for japanese calligraphy. You see the items mentioned above. Additionally, the small teapot-like container holds water to dilute the ink. You can see the block of ink resting on the ink stone. To use it, put a bit of water on the ink stone and move the block of ink back and forth over the stone. It can take up to ten minutes to make enough ink. 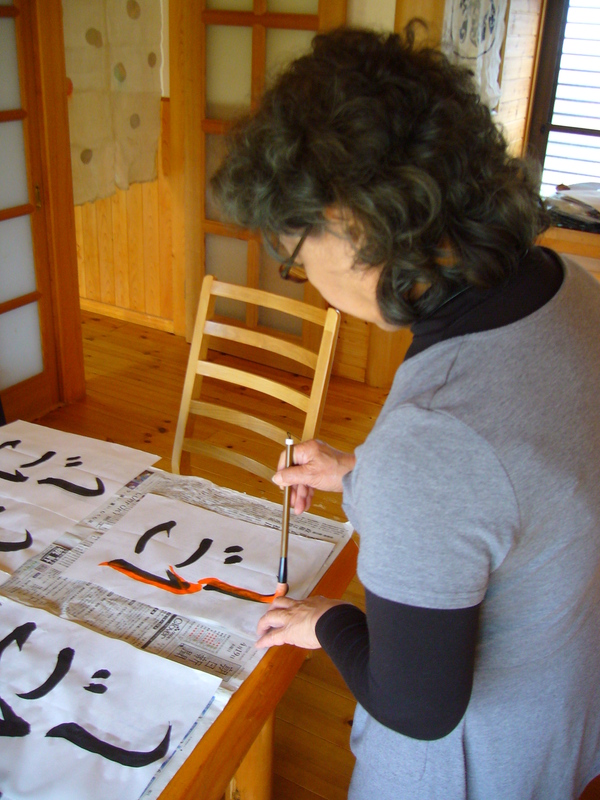 This repetitive action is meant to calm the mind before starting your calligraphy practice. But these days, many people buy ink in bottles that is ready to use. The very first exercise that a calligraphy student practices includes drawing a horizontal line (the kanji for ‘one’) and a cross (the kanji for ‘ten’). Many of the basic techniques are already included in this simple exercise. At the start of each class, my teacher usually tried the first few exercises together with me, noting points of interest and correcting mistakes. She then gave me an example in orange ink and left me copy this a dozen times. We would then line up my work on the table or on the floor and my teacher would correct the work with orange ink. She also choose the one she liked best at the end of every lesson and indicated it with an orange spiral over the calligraphy. My work from the first lesson lined up. Top left shows the first basic exercise. The other ones spell niji in hiragana (Japanese phonetic, syllabic writing system), which means rainbow. My classes lasted for about 45 minutes to one hour. Afterwards I always felt both calm and tired. If you are doing it right, you are very focused on every exercise you do, so it takes quite a bit of energy. But it is so much fun! And to get one even remotely right is so rewarding. I was always amazed at the ease with which my teacher writes her calligraphy. Once you have tried it yourself, you realize the years of practice it must have taken to write so beautifully and fluently. I only studied calligraphy for a few months but even during that time, I got a glimpse of the broader lessons it can teach you. During class, I was doing my very best to write as correctly as possible, paying attention to every detail. But due to my emphasis on form, my writing was lacking in energy. It turns out that I had to learn to let go a little and add some more vigour and joy to the strokes. A good lesson for life! 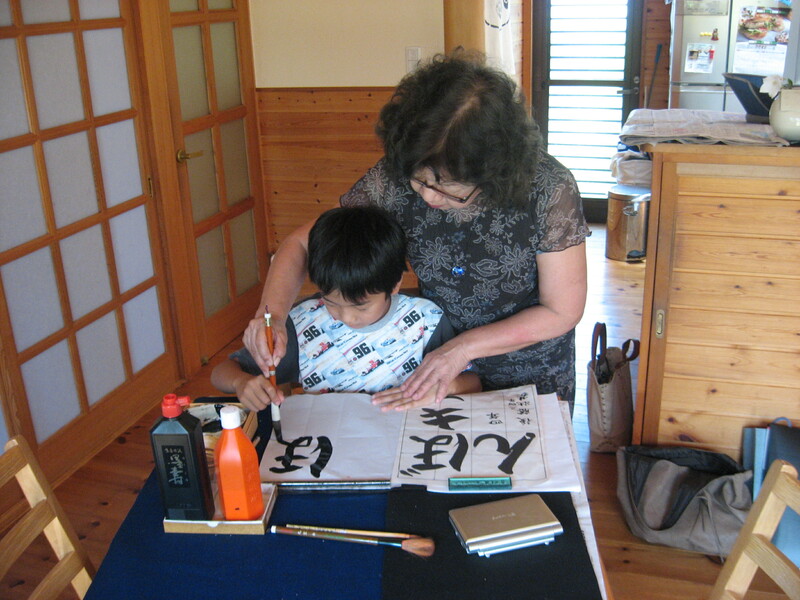 It helped me a lot to study together with my teacher’s grandson, whose personality embodied just the things my calligraphy was lacking: spontaneity and energy, which of course showed in his writing as well. 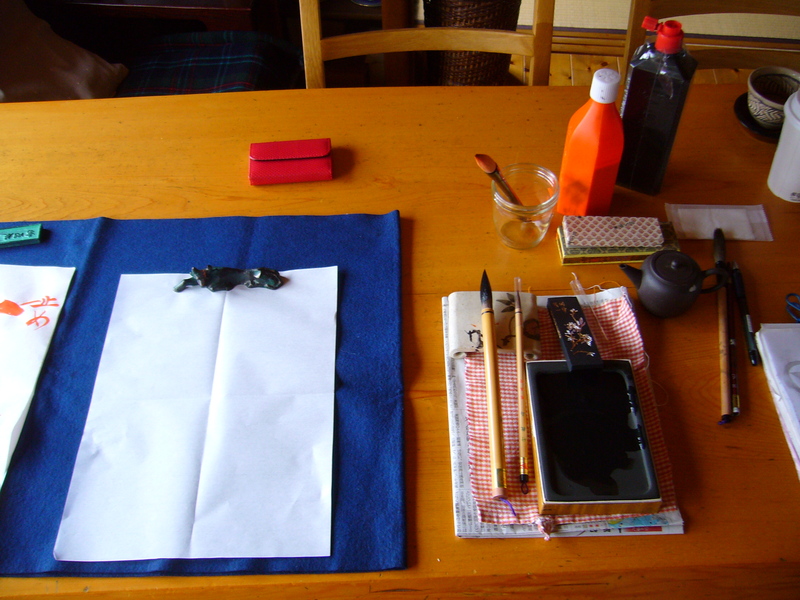 This entry was posted in Ancient arts, Culture, Japan and tagged Calligraphy, Calligraphy lesson, Japanese calligraphy, Japanese culture, Shodou, Shuuji, Traditional Japan by Haruko-chan. Bookmark the permalink. very nice. i never learned the art of calligraphy, though i’m chinese by blood. grew up in indonesia and taught to write in alphabets. now i wished my parents have taught me how. any plan to return in Japan? Not at the moment, unfortunately. I would love to go back someday though! How about you? Have you been there, or are you planning to go? Fascinating post! I learned things I never knew before. Thanks for sharing! So cool. I was never good at oshuji. Yours look fantastic. I was very lucky to get private lessons from such a good teacher. 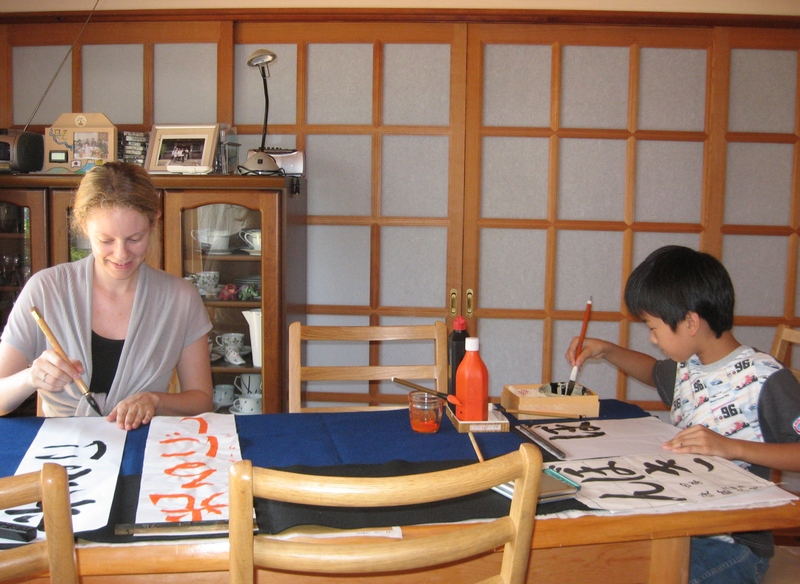 But I only started with oshuji a few months before we had to leave, so I couldn’t get very far with it. I hope I have the oportunity to continue studying it one day. Interessant: ik heb ongeveer hetzelfde meegemaakt in Japan. Mijn lerares was Tomoko Kurosaki sensei. Ze schreef ook voorbeelden in oranje en verbeterde op dezelfde manier. Zal bij gelegenheid eens tonen.